Brent Porche of 93.3 WMMR in Philadelphia caught up with Jared Leto, lead singer of 30 Seconds to Mars. 30 Seconds To Mars performed at the Bank United Center in Miami, Florida on March 9th. Watch fan filmed highlight clips from YouTube. 30 Seconds to Mars performed in concert at a Project 9-6-1 Secret Show on Monday (March 12) at Smith’s Olde Bar in Atlanta, Georgia. Check out pictures from WireImage. 30 Seconds to Mars performed at Live Music Hall in Cologne, Germany on January 19th. Watch fan filmed highlight clips from YouTube. 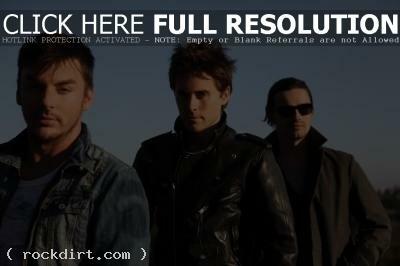 30 Seconds To Mars performed at the Electric Ballroom in London, England on Thursday (February 1). Watch fan filmed highlight clips from YouTube. Check out pictures from RexFeatures. +44, 30 Seconds to Mars, AFI, Fall Out Boy, Foo Fighters, Incubus, My Chemical Romance, Papa Roach, and Wolfmother performed durin night one, and Evanescence, Foo Fighters, Gnarls Barkley, Panic! at the Disco, She Wants Revenge, Snow Patrol, The Killers, The Raconteurs, and Angels & Airwaves performed during night two of the KROQ Almost Acoustic Christmas 2006 on December 9-10 at Gibson Amphitheater in Universal City, California. Check out pictures from FilmMagic, RexFeatures, GettyImages (night1 / night2), and WireImage (night1 show / night1 backstage / night2 show / night2 backstage). Buckcherry, Taking Back Sunday, Three Days Grace, The Red Jumpsuit Apparatus, Sugarcult, and 30 Seconds to Mars performed as part of the Buzz Bake Sale Concert at Sound Advice Amphitheatre on December 2nd in West Palm Beach, Florida. Watch fan filmed highlight clips from YouTube. Gerard Way of My Chemical Romance and Jason ‘Cone’ McCaslin of Sum 41 joined 30 Seconds To Mars for their party celebrating the special package CD/DVD release of 30 Seconds To Mars’ platinum album ‘A Beautiful Lie’ at Cinespace on Saturday (December 9) in Hollywood, California. Pictures from Getty Images have since been removed. 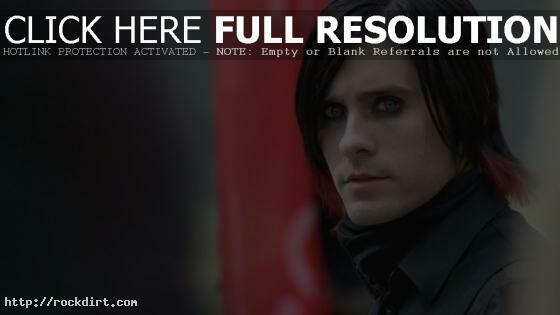 30 Seconds To Mars are out with the video to their new single ‘From Yesterday’, from the album ‘A Beautiful Lie’. Watch it below. 30 Seconds To Mars guitarist Tomo Milicevic spoke with Time Off magazine about talk the band’s debut album ‘A Beautiful Lie’ is a concept record. “We look at it like chapters in a book,” he suggested. “That’s why we number them chapter one, chapter two and so on. The whole record definitely talks about certain things from our point of view but every song is a complete story in itself. I feel like we could make a complete record that sounds like each song on the record and still have a pretty interesting-sounding record. Our songs are never literal and I know that Jared’s goal as a songwriter is for you to interpret it in your own way – to give you a manual to follow into your imagination.” The article at timeoff.com.au has since been removed.